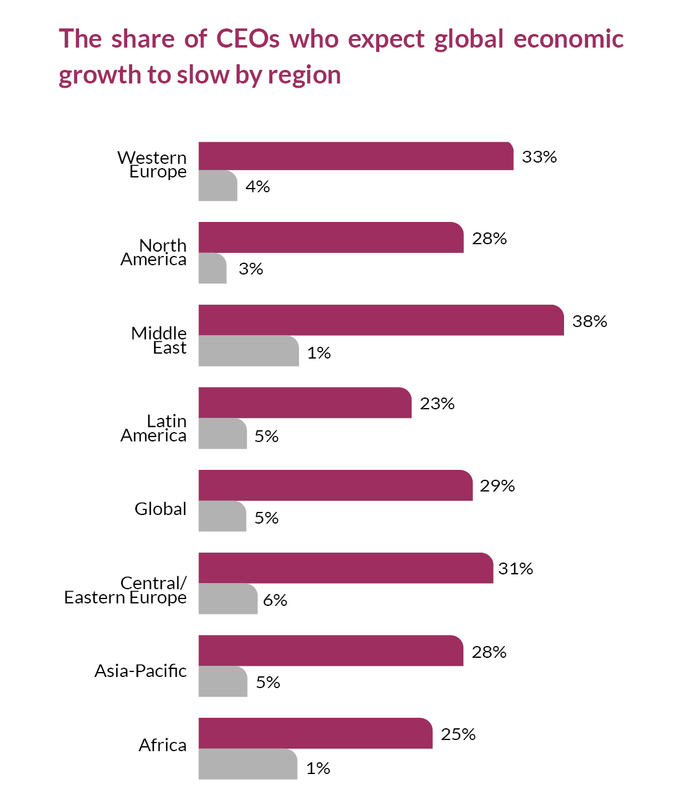 More CEOs in every region are wary about slowdown in global economic growth this year. The opinion was reflected in the PwC’s 22nd annual global CEO Survey and the results were released on the sidelines of the official WEF proceedings. Chief executives can play a credible role in predicting the direction of the global economy. An increase or decrease in their confidence levels regarding their own revenue prospects is a leading indicator of actual global economic growth in the year ahead. Last year, we saw a record jump in optimism regarding global growth prospects in 2018, and it was shared globally. However, this year, we are seeing a record jump in pessimism, with nearly 30% of CEOs projecting a decline in global economic growth, up from 5% in last year. In fact, many economists see a slowdown as overdue. This also means that we can expect less optimistic revenue growth of organizations around the world in both the short and medium term. Given the threats in the ecosystem of the business arena, coupled with trade and policy issues, many CEOs cannot identify up to three most attractive markets for investment outside their home territory. On the flip side, governments could view this as an opportunity to remind companies their countries are open for business and also come forward to resolve trade disputes and improve the geopolitical landscape. Always the most buoyant territory in terms of CEO revenue confidence, India has also recently surpassed China as the fastest-growing large economy and the government has enacted a series of measures designed to improve the ease of doing business there. Globalization had been on a steady march over the past 40 years, but that trend is hitting some political roadblocks. Whatever top executives or world leaders may feel about the future, it is only the combined effort of all parties that can pave the way for a steady and sustainable growth in the years ahead. If the trend is discerned, countries around the world were experiencing synchronous growth, meaning CEOs across regions were even more aligned than usual in their optimism about the global economy. In this year’s World Economic Forum, CEOs reflected that the synchrony works the other way, too. The growing bearishness is stark, as is the degree to which it is shared by business leaders regardless of their geography. This graph shows the concern on each threat that is supposed to slow down the growth of economy. 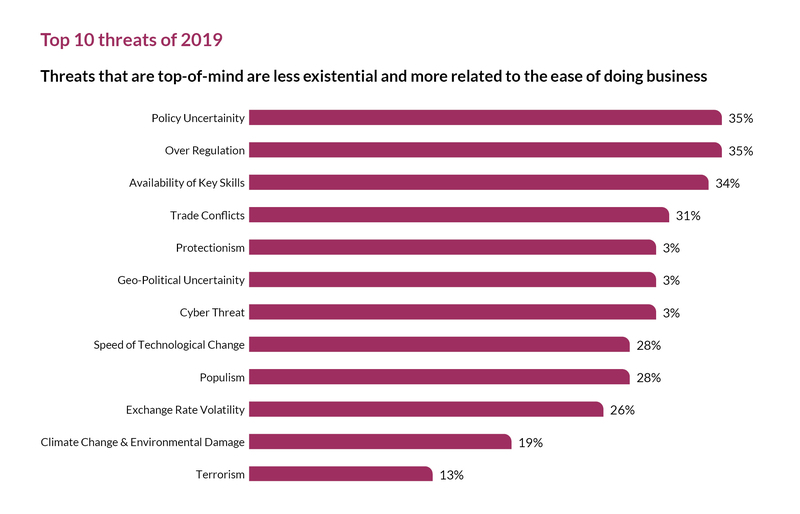 Most of the CEOs feel that policy uncertainty is the biggest threat for the business community for 2019. 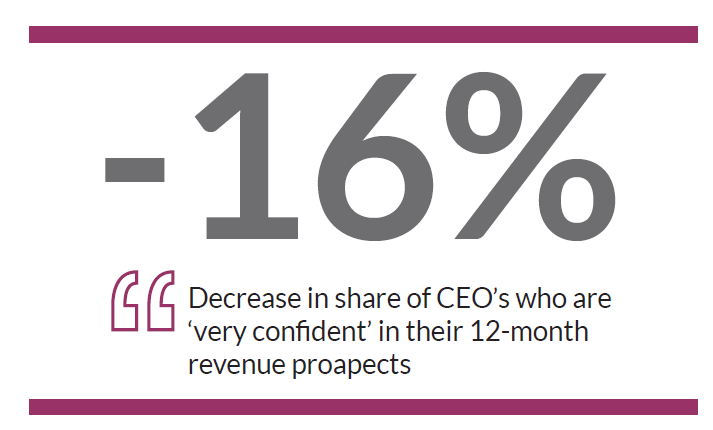 In general, fewer CEOs are ‘extremely concerned’ about any and all threats to their business, even as they demonstrate lower confidence in their own revenue prospects. CEOs are more mindful of what’s going on in their immediate purview as they await greater clarity on government actions and market conditions. Of those CEOs who expressed ‘extreme concern’ about the trade conflicts of 2018, the one between the US and China overshadowed other protectionist moves as particularly worrisome, with 88% expressing concern. It outweighed other trade tensions not only in the minds of Asia-Pacific and North America CEOs but also those in Western Europe. 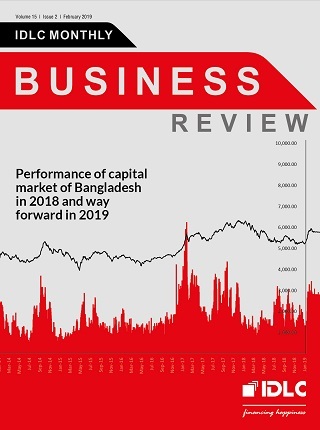 Asked how they were adjusting their operating model and growth strategy to accommodate these trade conflicts, most of these ‘extremely concerned’ CEOs responded they are not doing much beyond ‘adjusting their supply chains and sourcing strategies’. Jaime Augusto Zóbel De Ayala, Chairman and CEO, Ayala Corporation in the Philippines believes that the escalation taking place between China and the United States is actually leading to renewed opportunities within ASEAN. He thinks that supply chains are getting disrupted, and ASEAN will be a net beneficiary of this disruption. Now CEOs are turning to what they can actively control inside their organizations as they confront the cracks in their own capabilities, especially the information and skills gaps. The ‘information gap’ — the gap between the data CEOs need and what they get such as customer preferences and needs — has not closed in the ten years even with the advancement of technology. As for skills, there are no quick fixes when it comes to closing the skills gap that many chief executives are concerned about this year. Globally, CEOs see ‘significant retraining and upskilling’ as the best answer, and that will take time and money. Therefore, governments and businesses need to work together to help their people adjust to the disruptive impact of new technologies through both channels and build a culture of adaptability and lifelong learning to spreading the benefits of AI and related technologies widely through society.